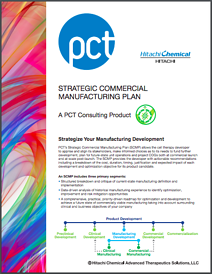 PCT’s Strategic Commercial Manufacturing Plan (SCMP) allows the cell therapy developer to inform and align its stakeholders, make informed choices as to its needs to fund further development, plan for future-state unit operations and project COGs both at commercial launch and at scale post-launch. The SCMP provides the developer with actionable recommendations including a breakdown of the cost, duration, timing, justification and expected impact of each development and optimization objective for its product candidate. The SCMP is a robust plan that includes and exceeds the content of the Strategic Manufacturing Assessment and Quality Risk Analysis. A thorough description of the current state of the developer’s manufacturing process, including current-state descriptions of Quality Target Product Profile, Critical Quality Attributes (CQAs), and Unit Operations (UO). Used to identify opportunities for optimization and improvement, as well as particular areas of challenge and risk. Here, strengths and weaknesses in a developer’s manufacturing process are identified in order to outline what is needed to successfully evolve from the current state to a state of commercially viable manufacturing by looking at quality, cost of goods, scalability and sustainability. Provided in the form of an optimization plan, based on the evaluation and analysis performed. Successful implementation of the optimization plan is needed to meet the commercial manufacturing vision of the cell therapy developer. It is important to note that while the scope of the SCMP is focused on manufacturing development, the plan must be crafted and executed in the context of all the other elements of product development. The SCMP is most appropriate for a cell therapy product developer with at least preliminary process and product definition, some first-in-man clinical testing, and a reasonable sense of the commercial prospects for their candidate product.